SINGAPORE, 4 DECEMBER 2018 – The first part of the Asian Football Confederation (AFC) ‘B’ Coaching Certificate Course commenced on 26 November and will conclude this Friday 7 December. A total of 18 participants – including former National Team defender Daniel Bennett and former S.League goalkeeper Ahmadulhaq Che Omar – are part of the course conducted by Football Association of Singapore (FAS) Coaching Instructor and former National Team Head Coach Vincent Subramaniam. Vincent is assisted by AFC Coaching Instructor M. S. Arasu and former Singapore Premier League side Hougang United FC head coach Philippe Aw. Open to coaches with a ‘C’ coaching certificate and at least two years of coaching experience, the course aims to develop coaches with the required competencies to coach players aged 14 to 19 years old as well as amateur players. A wide range of topics – including diet, nutrition, game systems and team tactics – are covered in both theoretical and practical modules. Course participant Jahsh Ruzzman, who is coaching at the F17 Football Academy, feels that the course has not only helped him to gain a deeper understanding of his role but also the necessary organisation skills as a football coach. 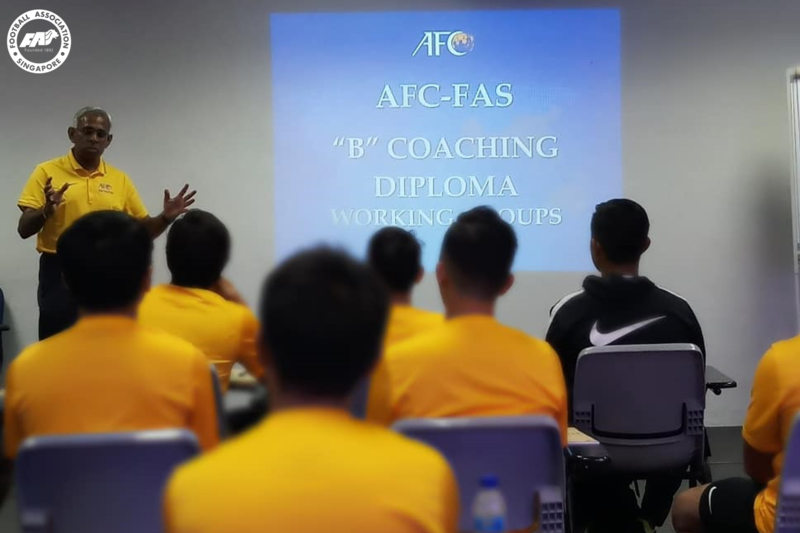 This is the second AFC ‘B’ Coaching Certificate Course organised by the FAS this year as part of ongoing efforts to upgrade the pool of existing certified coaches in Singapore. The second part of the course will take place from 21 to 26 January in 2019.